ProMark manufactures a complete line of Cathodic Protection Test Stations and Terminal Enclosures. The ProMark Model# PM-TS5 (Flush Mounted Test Station) is the latest addition to our line of Test Stations. The Flush Mounted Test Station is manufactured from a fiber reinforced thermoplastic material that is resistant to chemicals and other outdoor conditions. This Flush Mounted Test Station will not rust or corrode. Like all the other Test Stations ProMark manufactures, the PM-TS5 is UV resistant and is made to withstand direct sunlight and hold its original color unlike other Flush Mounted Test Stations that need to be constantly painted to maintain visibility. PM-TS5 can be installed in soil, asphalt and concrete. Our Flush Mounted Test Stations are molded with a steel insert for additional reinforcement and are detectable. A terminal board with standard stainless steel terminals is included with each Flush Mounted Test Station. Other accessories such as lug terminals, shunts and bonding straps are also available to meet your requirements and specifications. PM-TS5 Flush Mounted Test Stations are available in standard colors. Custom wording is also available to meet your specifications. For more information please visit our PM-TS5 Flush Mounted Test Station product page. Pro-Mark is now manufacturing a Flush Mounted Test Station. Our Model# PM-TS5 is the newest addition to our line of Test Stations. Our Flush Mounted Test Station is manufactured from a fiber reinforced thermoplastic material that is resistant to chemicals and other outdoor conditions. This Flush Mounted Test Station will not rust or corrode. Like all the other Test Stations Pro-Mark manufactures, the PM-TS5 is UV resistant and is made to withstand direct sunlight and hold its original color unlike other Flush Mounted Test Stations that need to be constantly painted to maintain visibility. Pro-Mark’s PM-TS5 Flush Mounted Test Stations are used to secure cathodic protection terminals, circuits, other line applications and can also be used as a valve box. The PM-TS5 can be installed in soil, asphalt and concrete. Our Flush Mounted Test Stations molded with a steel insert for additional reinforcement and are detectable. A terminal board with standard stainless steel terminals is included with each Flush Mounted Test Station. Other accessories such as lug terminals, shunts and bonding straps are also available to meet your requirements and specifications. PM-TS5 Flush Mounted Test Stations are available in all standard colors. Custom wording is also available to meet your specifications. Pro-Mark is an industry leader in manufacturing Test Stations and specializes in supplying cathodic protection solutions worldwide. The PM-TS3 Test Station is an enclosure that protects circuits and terminals. 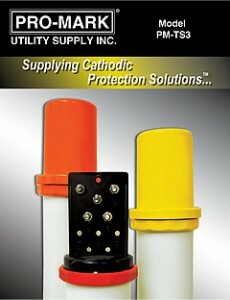 ProMark’s Cathodic Protection Test Station is also used in telecommunications as a grounding box. Test Stations are manufactured in the USA from high impact UV stabilized polycarbonate and have a lifetime warranty. PM-TS3 Test Stations come standard with five stainless steel terminals and could be ordered with High-Density Polyethylene conduit/support post. The PM-TS3 is also available with custom graphics as a Test Station Marker Post. 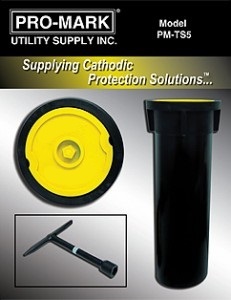 ProMark PM-TS3 Cathodic Protection Test Stations are in stock in all standard colors. * Custom Colors are available upon request.